For Anglicans the sacraments of Baptism, Confirmation, and the Eucharist, lay the foundations of every Christian life. We are born anew in our Baptism, strengthened by the Holy Spirit at our Confirmation and nourished in the Holy Eucharist with the food of eternal life. We affirm, through the Apostles’ Creed, our faith in God, Father, Son and Holy Spirit. We promise to “continue in the apostles’ teaching and fellowship, in the breaking of bread, and in the Prayers”. We promise to “persevere in resisting evil and, whenever [we] fall into sin, repent and return to the Lord”. We promise to “proclaim by word and example the good news of God in Christ”. We promise to “seek and serve Christ in all persons, loving our neighbour as [ourselves]”. We promise to “strive for justice and peace among all people, and respect the dignity of every human being”. Baptism is the door to life and to the Kingdom of Heaven, it is the beginning of a journey of faith, that requires from us a commitment and it initiates us into a relationship with Christ and with his Church. Baptism is without fruit if it is not lived out through these promises that we make, if we are not actively engaged in Christ’s mission; it is a serious commitment to a life centred in Christ and grounded in the Church. Christian parents bring their children for baptism because they want them to be a part of the Church. Parents and Godparents (or Sponsors) take on themselves promises on behalf of the child that they bring for Baptism. They also take on the responsibility of ensuring that this covenantal relationship between the child and God is nurtured so that the child will grow in faith and be able to make these promises for themselves at their Confirmation. Below you will find some guidelines that will help you when considering Baptism for yourself or for your child. It is the policy of the Diocese of Quebec that Baptisms should take place at the principal liturgy on Sunday. 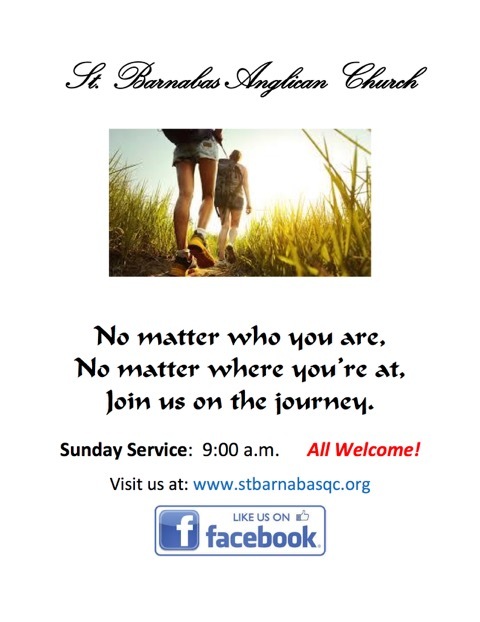 For St Barnabas this is the 10:00 am Eucharist. If, for some reason, there is a need for a Baptism to take place at another time please call the office. The Diocese of Quebec recommends the use of the liturgy from the Book of Alternative Services (BAS) because it is more explicit than the Book of Common Prayer (BCP) in its provision for the renewal of vows on the part of the congregation. The Diocese of Quebec strongly suggests a preparatory course for Baptism. For this reason, candidates for Baptism, or their parents, should contact the office at least one month before the suggested date for the Baptism to allow for this preparation.